** The times that buses arrive at the stops are approximate so the bus company recommends you to be at the stop some minutes before the time indicated. On this route, origin LEIOA destination Vitoria-Gasteiz, it is not possible to buy your ticket in advance. If you are an occasional passenger, wait at the stop and buy your ticket from the driver. 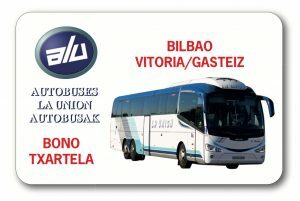 In the direction, origin Vitoria-Gasteiz destination Leioa, it is possible to get your ticket in advance and guarantee your seat, either by buying it at the ticket office or on the web page from the company www.autobuseslaunion.com or at the vending machines in the station. 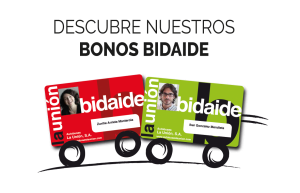 The bidaide season ticket allows you to get tickets for the days and times you are going to travel only in the direction origin Vitoria-Gasteiz destination Left Bank. If you have a BIDAIDE SEASON TICKET and you know you will be travelling daily at a specific time, you can get your ticket in advance at ticket offices or vending machines in the station. You just have to show your season ticket. Tickets can be obtained up to one week in advance of the days and times you wish to travel. On the day you travel, there is no need to go through the ticket office. You can go directly to the bus, either in the station or at the bus-stops, and show the driver the corresponding ticket.